Part of Attack Bear Press' mission is to collaborate and create with artists, authors, and performers in Western Massachusetts, the USA, and across the world. We are honored to have already worked with so many talented people. Check out some of our friends and partners below! If you are interested in working on a project with Attack Bear Press then drop us a line. We'd love to hear from you. Miguel Bacho Cabezas was born in Iquique, Chile, in 1986. There, he participated in several local initiatives, such as Literary Caravans to Cochabamba and La Paz, Bolivia in 2010. In 2013, the Universidad Nacional de Lanús Press in Argentina published his first book of poems, Papeles Sueltos. Half of this printing was sent to Iquique’s public Libraries. Between August and October of 2016, Miguel collaborated with the website www.viceversa-mag.com in the section Crónicas Urbanas. He is currently working on his second book, Labores, which he hopes to publish in 2017. In addition to his manuscript, Miguel is finishing his website www.miguelbacho.com, a selection of articles, poetry and collaborations. Miguel currently resides in Providence, RI. Adam Grabowski’s poetry has appeared in Off the Coast, Beech St. Review, Drunk in a Midnight Choir, Black Napkin, and elsewhere. His poem “Aphorism,” was included in recent antholigies from jubilat and The Rattling Wall. Adam has been featured at the New York City Poetry Festival, the Mass Poetry Festival, and elsewhere. A Hamden County rep. for masspoetry.org, he received his MSW in 2012 from Westfield State University and lives with wife and two daughters in Holyoke, Ma. Founded in 2012 by Kevin Walker, Union St. Records is a prolific genre defying recording collective. Making their home in Easthampton, MA, and embracing the regions DIY spirit the collective has produced 23 albums, with more music being created all the time. Click the image above to check out their blogspot, and "Learn More" to find their complete discography on Discogs.com. “In 2012, I started writing poetry. 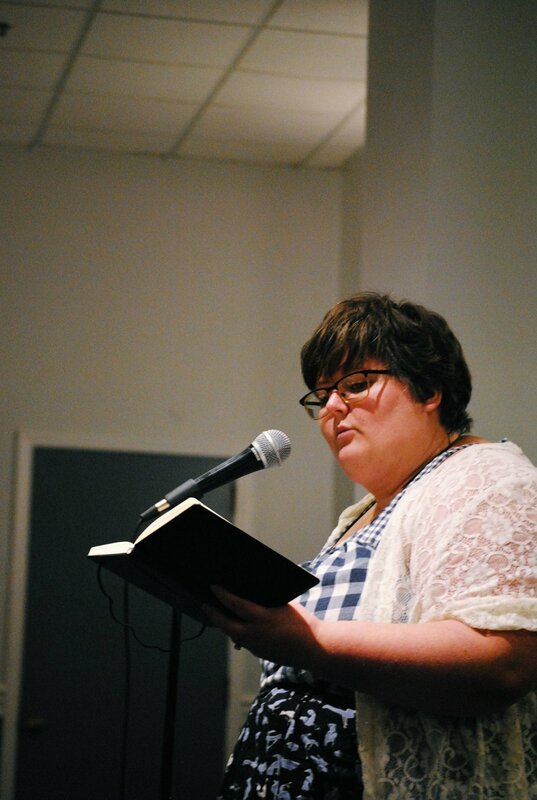 Because I love the sound of my own voice, and engaging in processes that grant me forms of validation, I started participating in open-mics and slam competitions. I write about topics like mental illness, fatness, gender, and occasionally other things that either grind my gears or make me weepy. Sometimes I'm funny."